Maryam Mirzakhani, who in 2014 became the first woman awarded the prestigious Fields Medal for mathematics, has died at the age of 40. The world-renowned Iranian mathematician and Stanford professor died from breast cancer at a hospital in the United States. 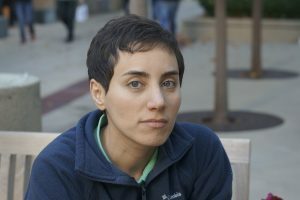 Born in Tehran in 1977, Mirzakhani won two international math awards as a teenager. Despite an auspicious start, she said that she had no intention of pursing mathematics. She liked to read and thought that maybe she would become a writer. “My most exciting pastime was reading novels; in fact, I would read anything I could find,” she said in a 2014 interview with The Guardian. It was at Sharif University of Technology in Iran, where she received her Bachelor of Science, that she discovered her passion for mathematics. “The more I spent time on mathematics, the more excited I became,” she told The Guardian. Mirzakhani completed her PhD at Harvard in 2004, then accepted positions as a research fellow at the Clay Mathematics Institute and an assistant professor at Princeton, accruing awards and acclaim along the way. In 2008, at 31, she became a professor at Stanford. And then, in 2014, she received the highest honor in mathematics: 80 years after the award was established, Mirzakhani became the first woman to win the Fields Medal. She was also the first Iranian to receive the prize, which is given every four years to exceptional mathematicians under the age of 40. She won the prize for a 172-page paper on the trajectory of a billiards ball around a polygonal table that has been hailed as a “titanic work” and the “beginning of a new era” in mathematics. Mirzakhani studied the complexities of curved surfaces such as spheres, doughnut shapes and hyperbolas. She said in interviews that she liked the interdisciplinary connections and implications of her work. “I find it fascinating that you can look at the same problem from different perspectives and approach it using different methods,” she said. Mirzakhani, who described herself as a slow mathematician, was drawn to big, difficult questions in her field, a trait that made her a revered figure within the mathematics community. As a professor and scholar, Mirzakhani’s pictures helped her write stories with her math. In a way, she told Quanta, working on mathematics is a lot like writing a novel. She is survived by her husband, Jan Vondrák, and their daughter, Anahita. Left: Professor Maryam Mirzakhani, the recipient of the 2014 Fields Medal, the top honor in mathematics. She was the first woman in the prize’s 80-year history to earn the distinction. Photo courtesy of Stanford News Service.